Physicists have teleported quantum information between two atoms separated by a significant distance, for the first time. Until now this feat had only been achieved between photons, and between two nearby atoms through the intermediary action of a third. According to researchers, this advance could be a significant milestone in the quest for a workable quantum computer. Quantum teleportation is a remarkable form of transport only available to particles at the atomic and subatomic scales. Information such as the spin of a particle or the polarization of a photon can be transferred between particles without travelling across a physical medium. Teleportation is made possible by the feature of quantum mechanics known as "entanglement". Our system has the potential to form the basis for a large-scale ‘quantum repeater’ that can network quantum memories over vast distances Christopher Monroe, University of Maryland. According to quantum mechanics, when particles become entangled the very act of measuring the quantum state of one particle instantly reveals information about the state of the second. In theory, this effect should occur regardless of distance between particles. In practice, it is very difficult to observe because of external influences. If the particles interact uncontrollably with the environment or if you try to record two quantum states directly — entanglement vanishes. Now researchers at the University of Maryland and the University of Michigan have successfully teleported quantum information between two ytterbium ions separated by 1 m, reporting a 90% success rate. They employ a new method of teleportation where ions are stimulated to emit photons and the quantum states are inferred from the colour of these emissions (Science 323 486). "Our system has the potential to form the basis for a large-scale ‘quantum repeater’ that can network quantum memories over vast distances" said group leader Christopher Monroe of the University of Maryland. In quantum teleportation the sender (Alice) instantaneously transfers the quantum state of a particle to a receiver (Bob). In 1997 physicists achieved teleportation of quantum states between photons for the first time. Their methods exploited the uncertainty principle: Alice could not know the exact state of her photon, but the effect of entanglement meant that she could still teleport her state to Bob. Then in 2004 separate teams of physicists at the National Institute of Standards and Technology (NIST) in Colorado and the University of Innsbruck in Austria demonstrated teleportation at the atomic scale for the first time. Using slightly different methods, they transferred spin between pairs of ions trapped in a harmonic potential. Unfortunately, teleportation — using these methods — is restricted to very short distances because harmonic potentials are molecular in scale. Now Monroe and his team have taken teleportation in a different direction. They first isolate the ytterbium atoms in separate vacuum traps surrounded by electromagnetic fields. Each ion — in its ground state — is then irradiated with a microwave burst which puts the ions in a superposition of two different quantum states. 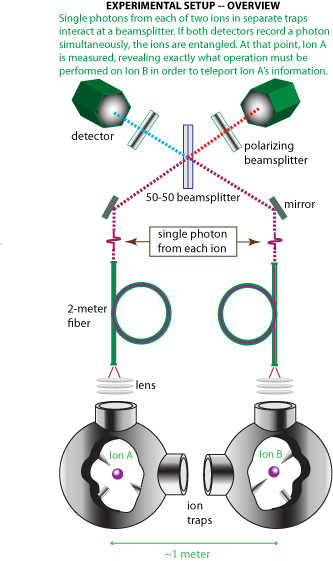 Next, a short laser pulse excites each ion which subsequently leads them to emit photons whose colour is a superposition of red and blue — linked with the two available quantum states. The red photon or the blue one? 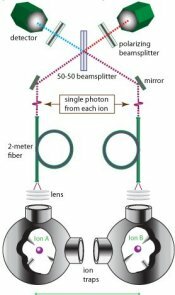 Once generated, these photons are then directed towards a beamsplitter where they have an equal chance of passing through or being reflected. There is a detector on either side of the splitter. According to the researchers, a red-blue combination detected at exactly the same time is a clear sign that the ytterbium atoms are entangled. When this occurs the researchers immediately return to the ions where they determine the quantum states using a process known as quantum tomography. "One particularly attractive aspect of our method is that it combines the unique advantages of both photons and atoms," said Monroe. "Photons are ideal for transferring information fast over long distances, whereas atoms offer a valuable medium for long-lived quantum memory." The next step for this research is to further improve the success rate of the measurements. "We are looking into putting an optical cavity around each atom — which could yield orders of magnitude improvement in the success rate of the system," said Steven Olmschenk, a member of the research team. Boris Blinov at the University of Washington told physicsworld.com: "Olmshenk and his colleagues have generated an entanglement and used it to teleport quantum data in what I consider the most promising ‘qubit’ [quantum bit] candidate yet — the trapped ion system." He added, "We are one major step closer to the our elusive goal."